Hypoallergenic dog shampoo for your Weimaraner? Isn’t that just for prissy little lap dogs? Well, maybe. The truth is that there are some Weimaraners who should be using hypoallergenic shampoo. 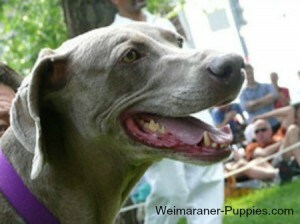 Weimaraners are strong, active outside dogs who love to romp in outdoor areas. They also tend to abuse their coats and skin. 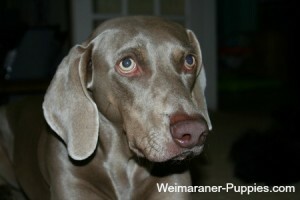 In addition, Weimaraners tend to have sensitive skin. Their sensitivity can be due to a number of environmental issues. Or your dog might just come home after a run with scratches, bruises, and irritation from allergens. 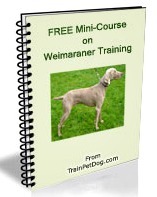 can keep your Weimaraner’s skin healthy. Why Use Hypoallergenic Dog Shampoo? One way to tell if your dog needs to use hypoallergenic dog shampoo is to observe her. Is she scratching all the time? Have you noticed dog dandruff or dry, flaky skin or hair loss? 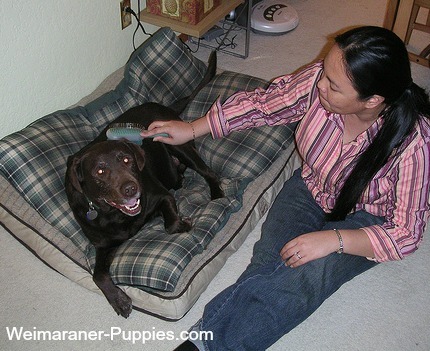 Does your dog have any hot spots? If so, she may need to use a hypoallergenic shampoo for dogs. Hypoallergenic shampoo has been proven to soothe and relieve itching for a Weimaraner who suffers from dog skin allergies–or just from dryness due to low humidity in the winter. Hypoallergenic dog shampoo can effectively prevent skin irritation. And the shampoo moisturizes dry flaky skin caused by allergies. Especially if you have a sensitive dog, use only scentless dog shampoos or shampoos with natural scents, Unnatural scents or chemicals can actually cause irritiation to your dog’s skin. In addition, you should never use shampoos intended for humans (even hypoallergenic shampoos) on your dog. Human shampoos contain harmful ingredients that may cause damage to your dog’s coat or irritate her skin. Healthy Breeds has a number of shampoos, each with its own special characteristics. So you can just pick the one that seems best for your dog. The shampoos are made in the USA and have a 100% guarantee for your satisfaction. They are pH balanced and soap-free. Oatmeal and Aloe – Good for dogs with sensitive skin, this shampoo has a Pina Colad scent. It restores moisture and natural emollients to your dog’s skin and coat. Deodorizing Shampoo – This shampoo contains essential fatty acids that nourish the skin and prevent flaking. It has a Sweet Pea and Vanilla scent. Chamomile Shampoo – Made with pure botanical extracts, this shampoo contains chamomile, aloe vera (soothing), oatmeal, calendula (healing), fir needle extract and cactus. It gently conditions the coat and re-moisturizes with natural oils. Herbal Avocado Shampoo – Dogs with allergies and sensitive skin will benefit from this shampoo. It will loosen dry crusty scales and help you remove dead skin and debris. This is the one to use if your dog has fleas or flea allergies. Smelly Dog Shampoo and Conditioner – With baking soda, oats, wheat and coat conditioners, this is the shampoo for dogs who love hunting and running through fields and forest. The shampoo will help clean, deodorize and condition your dog’s skin and coat. For dogs with dry or normal skin and coats. Designed for puppies, this shampoo has all natural ingredients, with nothing in it that would harm your puppy. It is not tear free, but shampoos that are tear free have extra ingredients that numb your dog’s eyes. Not something that I recommend! The shampoo helps to soften your puppy’s coat, leaving him smelling fresh and clean. This shampoo would be a good choice for your dog is he has irritated, itchy, sore and sensitive skin. A good choice for hunting dogs, this shampoo is scent free and quickly cleans off the pollen and other allergens after a day in the field. Earthbath is tearless and mild. It is chemical free, dye free and fragrance free. It’s even biodegradable. Oxgord Shampoo is certified organic and it contains some wonderful natural ingredients. Oatmeal, known for its soothing properties, shea butter, jojoba, coconut oil and aloe vera. This tearless shampoo actually restores essential oils in your dog’s coat. After rough treatment in the field, a soothing and refreshing bath is in order for your dog’s coat and skin. Us this shampoo for irritation from fleas, dander and dry itchy flaking skin. It will leave your dog’s fur smooth and soft.